The various reports presented by Dr. Philip Karber of Georgetown University have focused on two main issues: Chinese tunnels and the number of warheads China may have. The vast majority of his reporting and the reference material his students collected are about the tunnels. I have tried to be clear from the beginning that I am only talking about the warhead numbers, since that is the issue where the Union of Concerned Scientists has expertise. While the warhead issue is a relatively small part of the presentations Dr. Karber has been giving, it has been prominent and attracted attention because the number of Chinese nuclear weapons he has discussed is 10 to 15 times larger than most estimates. Not surprisingly, those of us who follow these issues have wanted to understand the source of those numbers, since this issue is important for U.S. policy. And as part of his presentations, Dr. Karber has included a set of references on his slides to back up his numbers. Those are the references we have looked at in detail. What we have found is they are not credible or authoritative. If he has better sources on the warhead issue it would be odd that he has not included them in his presentations since this issue has been under discussion for several weeks. Dr. Karber just published a new version of his report that contains a new slide (below) on China’s nuclear arsenal, which unfortunately continues to muddy the water. The slide indicates the 2,350 number it contains is from “PRC ‘95 data.” The list of sources below the graph includes a new reference supporting this number, which is a Chinese language blog post. However, this post does not contain “PRC ‘95 data,” but instead explicitly states, in its first sentence, that the 2,350 number comes from the Hong Kong magazine The Trend. This is the same source identified by the other Chinese bloggers cited as references on Chinese warhead numbers in Dr. Karber’s previous reports. As I’ve discussed previously, my analysis has shown that is not a credible or authoritative source. Dr. Karber notes his Georgetown group has collected an enormous amount of information. 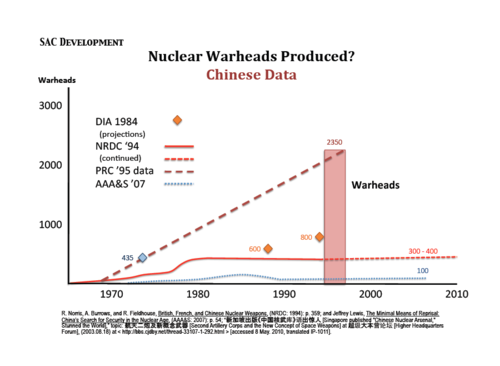 I would be happy to work with Dr. Karber and his students to evaluate or double check any additional information on Chinese warhead production they might find in the data they have collected. We can and should work together on this very important issue.